Benton City Hall is located at 114 South East Street, Benton, AR 72015; phone: 501-776-5900. Photo: J. W. and Ann Lowe Clary House, ca. 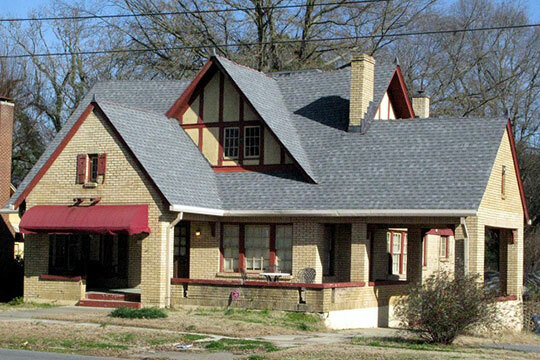 1926, 305 N. East Street, Benton, AR. Listed on the National Register of Historic Places in 1993. Photographed by user:Marlo B. Krueger (own work), 2012, [cc-by-3.0 (creativecommons.org/licenses/by/3.0)], via Wikimedia Commons, accessed September, 2013. The wide streets and low brick buildings of Benton are grouped around a courthouse and its square. About half way between Little Rock and Hot Springs, the town is on a site that was subdivided in 1836 and sold on the installment plan. In 1838 Benton had a race track, long before the spa to the southwest had one. The first industry of record was a salt works, opened in 1827, and later abandoned. Potter-making had become important before 1900, and about the turn of the century large numbers of lumberjacks went into the surrounding forests of pine, oak and gum. In the last few years the manufacture of inexpensive furniture has employed several hundred of the town's workers. The Saline County Courthouse, at North Market and Sevier Streets, is a two-story, buff-brick structure completed in 1902. A pair of one-story wings were added during 1938-1939. A Roman arch terminates both ends of the open hallway that divides the original building. The roof line, broken by many gables and chimneys, is dominated by a tall, pointed clock tower rising at one corner. The McCoy-Couch Furniture Plant, at Southeast Street and Sheridan Highway, specializes in living room furniture. Because of heavy use and frequent style changes, living room furniture becomes obsolescent rapidly, and the demand is therefore fairly constant. Bedroom furniture is the principal product of Owosso Manufacturing Plant at the east edge of Benton. Adjoining the plant on the north is the Veneer Mill, where huge booms drop logs cut from the Saline River bottoms into vats of boiling water; here they are soaked until ready to be cut into plywood. At the southern end of Market Street is the Niloak Pottery Plant, named from a reversed spelling of kaolin. Nearby deposits furnish the raw material for vases, jugs, churns, and other vessels. Pottery-making is essentially a hand industry, although the wheels are motorized. The Niloak plant maintains an exhibition ship east of Benton on U.S. Route 70. Works Progress Administration, Federal Works Agency, Arkansas Writers' Project, Arkansas: A Guide to the State, American Guide Series, Arkansas State Planning Board, 1941.